In meetings with ambassadors, Sushma Swaraj reiterated that India must continue to closely watch all Chinese activities, and advise and educate friends in the neighbourhood about how a certain kind of economic engagement with Beijing can have negative consequences for them. Hindustan Times, New Delhi: India will adopt a broad, three-pronged approach to deal with China’s increasing engagement in the South Asian and Indian Ocean neighbourhood — track Beijing’s activities carefully; pursue its own projects and commitments; and educate and advise neighbours on the consequences of engaging with China. 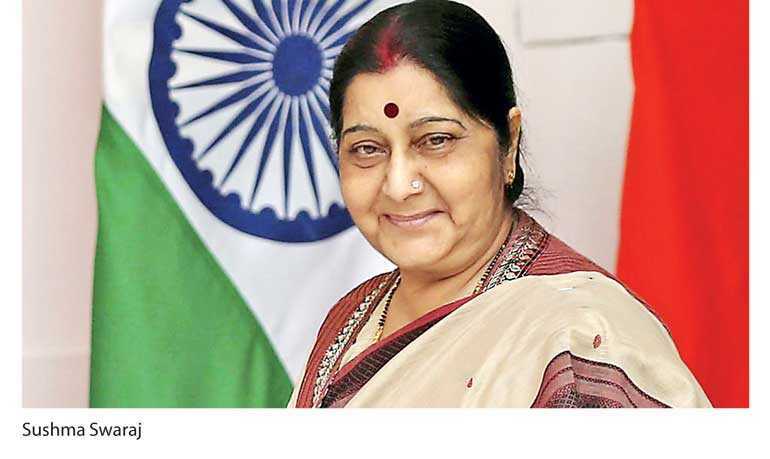 External Affairs Minister Sushma Swaraj laid out this approach at a meeting with top diplomats posted in the neighbourhood recently on the sidelines of the Head of the Missions Conference, said four officials familiar with the development. The meeting was attended by Minister of State MJ Akbar; Foreign Secretary Vijay Gokhale; India’s Ambassador to China Gautam Bambawale; and the country’s envoys to the South Asian Association for Regional Cooperation countries — Ajay Bisaria in Pakistan, Vinay Kumar in Afghanistan, Manjeev Singh Puri in Nepal, Harsh Vardhan Shringla in Bangladesh, Taranjit Singh Sandhu in Sri Lanka, Akhilesh Mishra in the Maldives and Jaideep Sarkar in Bhutan. Indian High Commissioner to Mauritius Abhay Thakur and Ambassador to Myanmar Vikram Misri were also present. This was a sub-set of the larger HOM Conference, a closed-door annual MEA affair. This year, multiple themes came up, from the need to focus on Indians in distress abroad and deploying soft power and celebrating Gandhi’s 150th birth anniversary, to India’s global development assistance and cooperation and evolving regional and geopolitical dynamics, said a fifth government official. Swaraj gave the inaugural address and PM Narendra Modi delivered the final keynote speech at the meeting. It was on the sidelines of this conference that Swaraj held both individual and region-specific meetings with ambassadors posted in Europe, Gulf, African and Latin American countries, besides the neighbourhood. “The idea behind the region-specific meetings is to ensure a broad commonality of approach since there are many overlapping themes; it is to understand, in a free and frank internal setting, the views of different ambassadors and if there is anything the ministry can do to help,” said the fifth official. Kicking off the neighbourhood meeting, according to the first official, Swaraj asked the ambassadors to give her a broad sense of what China was doing in each of their countries. Each envoy then spoke briefly about Beijing’s footprint in the country they serve. According to the first four officials, the broad sense in the meeting was that in Pakistan, China’s economic and political dominance had only grown; in Afghanistan, China could not be a strategic partner but its economic and development footprint was minimal and there was room for engagement; in Nepal, while Beijing’s involvement had grown, PM K P Oli’s recent visit to China had not broken new ground and was a reiteration of past agreements; in Bangladesh, while the Chinese have made huge economic commitments, many in Dhaka were wary of the ‘debt trap’ Sri Lanka found itself in; in Sri Lanka, while the government remained politically friendly to India, its economic ties with China had continued apace. In the Maldives, according to the first and second officials, the presentation focused on how there was a conscious attempt by the regime in Male to erase the Indian footprint altogether and China had gained tremendous leverage with investments, already made or in progress, in an airport, bridge, islands and port. One ambassador, according to the third official, laid out the border context and emphasised that Beijing had given up its defensive posture and was aiming for a ‘Pax Sinica’, indicating its ambitions of hegemony. “India has to recognise this and make a choice accordingly,” the official said. After listening to all the presentations, Swaraj said - according to both the first and second official - that Delhi’s focus must not be on competing with China on resources. Instead, she reiterated, India must continue to closely watch all Chinese activities; it must push ahead, with full vigour, its own work, and advise and educate friends in the neighbourhood about how a certain kind of economic engagement with Beijing can have negative consequences for them. This refers broadly to the phenomena of big investments in economically unviable projects with Chinese loans, which then gives Beijing both an economic and strategic foothold and “traps” the country. It is important to understand that China is now explicit about its global and regional ambitions, and within that, its periphery is of high priority, said former ambassador to China and Institute of Chinese Studies Director Ashok Kantha. “On our response, the most important part is not to try to mimic or ape China. We don’t have to be paranoid about them in the neighbourhood either. They have their own advantages and disadvantages. We need to work on our strengths and leverage those. There is extensive synergy and our inter-connectedness straddles across domains -- from physical proximity to economic ties to cultural links,” Kantha said. He added: “It is not a question of us educating them, but countries can increasingly see the pitfalls of going ahead with projects which may not be economically viable, without due diligence. They can see the BRI (Belt and Road Initiative) is not the free largesse it was supposed to be. BRI is a Chinese initiative to expand its influence abroad by financing infrastructure projects including railways, roads and power projects, thereby opening up potentially lucrative business opportunities for Chinese companies.